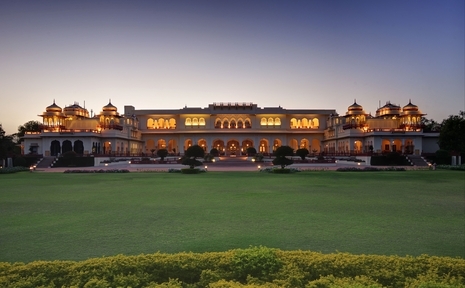 The Rambagh Palace hotel captures everything I seek and adore in a world-class hotel. 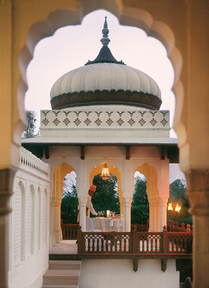 I’ve been staying there since I was a student traveling around India—and it is more magnificent than ever. 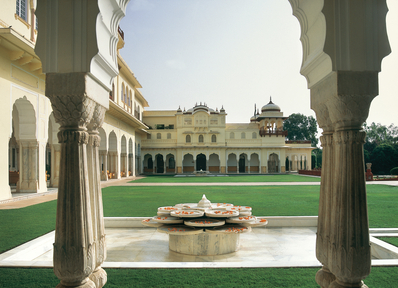 You know how much I love India—and the Rambagh is an essential part of the attraction. I encountered the great British actresses, Dame Judi Dench and Dame Maggie Smith, along with Dev Patel and Freida Pinto (the lovers in ‘Slumdog Millionaire’), and Bollywood megastars, as well as a glamorous Indian bridal couple and their families—all guests of the hotel. But still, this hotel is not at all a celeb hangout. It is so discreet and low-key you might even believe you are the only guest (my ideal). Follow me for a close-up look. Rapture: See why I love and admire the Rambagh Palace hotel architecture, gardens, privacy, people and setting. Then I’ll take you along—in the Maharajah’s vintage automobile—to Jaipur’s Gem Palace to view treasures galore. Peacocks, golden orioles, and blossom-headed parakeets preen and shriek on the lawns, and iridescent golden lilies and magenta bougainvillea spill over the parterres. The hotel is in the center of Jaipur—and the city swirls around with temple bells and klaxons ringing out in the distance—but the grounds feels like a remote country estate with acres of gardens, fountains, a spa, paths to explore, scampering squirrels, and manicured flower beds. 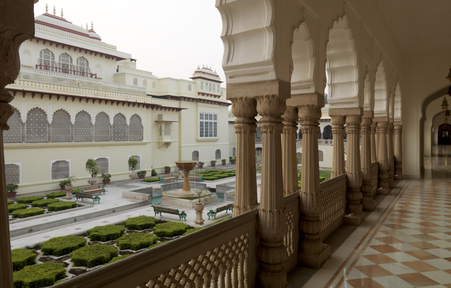 The Rambagh Palace was originally built in a traditional Mughal style in 1925 as a sprawling country retreat for Jaipur’s royal family. 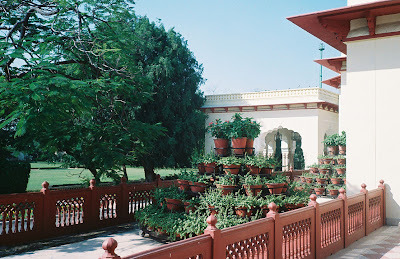 It was the private residence of the Maharajah and Maharani of Jaipur (see my feature on a visit to Gayatri Devi in THE STYLE SALONISTE archive). 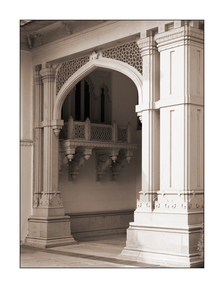 The palace became a hotel under Taj management in 1957 and even today it retains the air of a romantically regal residence. I love arriving there—to be greeted by tall, majestic, uniformed doorman, so regal, and the perfectly polished male managers and delightful female concierges and butlers and managers. The elegant Rajasthani decor, newly refurbished, includes opulent brocades and antique carved furniture, and the raj-y mood suits the loyal clientele wonderfully. I like suites with garden terraces where I enjoy breakfast or evening relaxation. I must tell you that I am very much at home in India, and have immersed myself in the culture, the history, Indian literature and music, design and textiles and architecture. There is much delight. Sometimes it is overwhelming, in a thrilling way, but still the joy can make you jittery! That’s why the calm demeanor of the Rambagh is so appreciated. 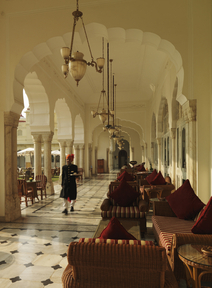 After a day exploring the rich tapestry of Jaipur’s bazaars and palaces, guests gather on the hotel’s open terraces or at the Polo Bar surrounded by nostalgic photographs of the handsome Maharaja of Jaipur on the polo field. I usually avoid—always--any folkloric performance, but I’m mesmerized and captivated by the dances and traditional music presented each evening as guests gather for evening cocktails. There’s also a palm reader! Love it. A private celebration in the Chinese room, with jade and semi-precious stone-ornamented lacquer walls, should be followed by a specially choreographed show of Indian fireworks in the garden. Traditional handcrafted Indian fireworks are remarkably vivid and full of giddy surprises. 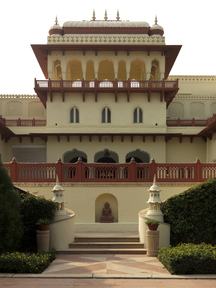 Best accommodations include the Kamal Mahal and Prince’s suites, which have a private porte-cochere entrance. The Maharani suite’s vast Art Deco-style marble bathroom is the essence of luxury. I love any suite that has a private entrance and a terrace. A guest can imagine that this is their own residence. Female guests appear in Loro Piana white linen blouses and linen slacks, and pretty sandals and Indian jewels for evening. The men in classic warm-weather sportswear add Hermes belts, navy blazers for evening. 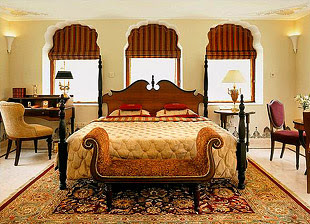 To reside in a private palace in Jaipur would be heaven, indeed. 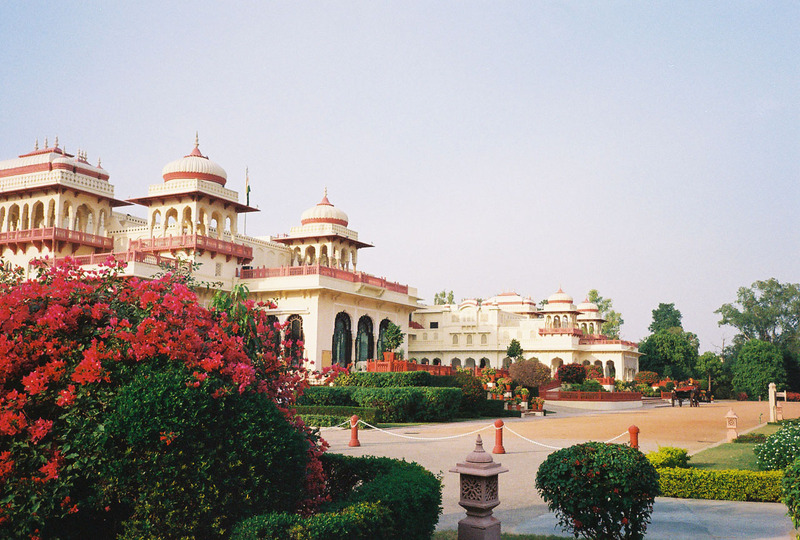 Royalty and heads of state and glamorous jet-setters were drawn to the cosmopolitan Maharajah and Maharani of Jaipur. Jackie Kennedy, Queen Elizabeth, nabobs and Nizams, lords and ladies of the British Raj all visited in the days when the Maharani (whose former Lilypool residence is still nearby) was one of the world’s great beauties, and the Maharajah was a champion polo player. 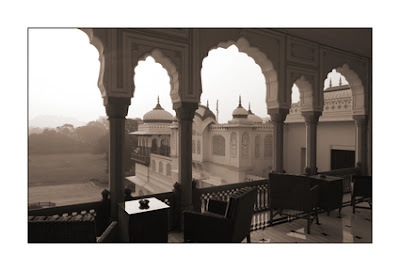 The Taj hotel management company conscientiously updates the hotel, enhancing the luxury without any apparent changes—while protecting and enhancing the essence and timeless soul of the palace. It lavish and authentic. 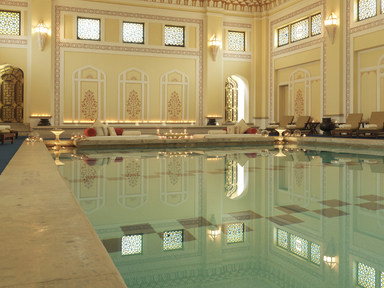 On a hot spring day the white marble halls and marble-floored suites afford a precious retreat. 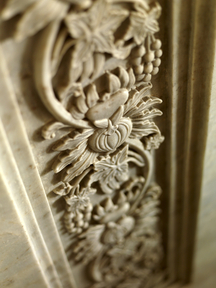 Sometimes (every day in India) I am fizzy with joy—so marble keeps me cool. Almost. 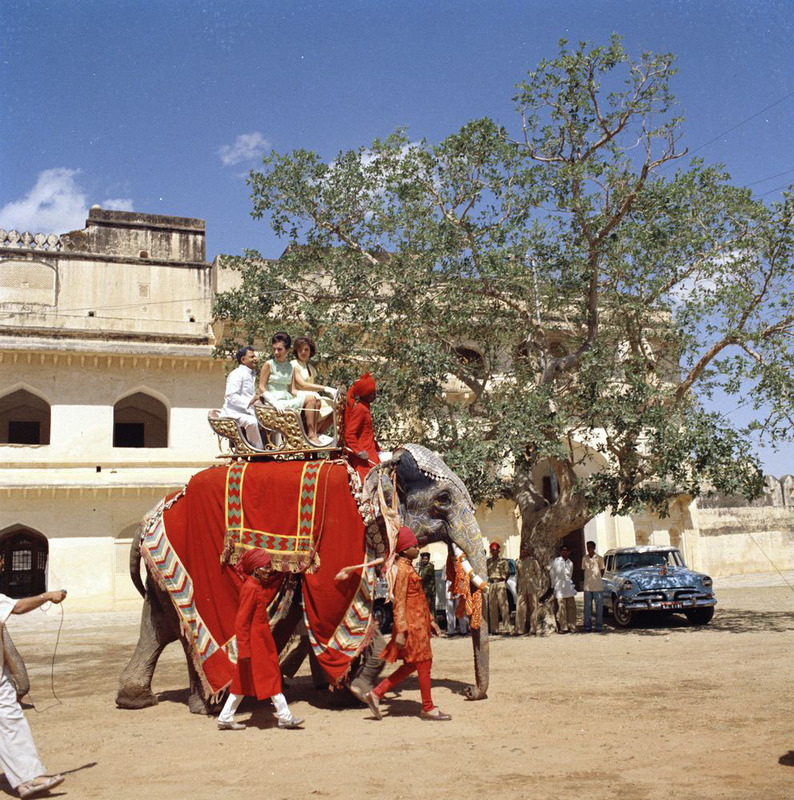 In the evening guests returning to the hotel pass hallucinogenic wedding parades with caparisoned elephants and corybantic guests and musicians, and the vibrant life of Jaipur all around. 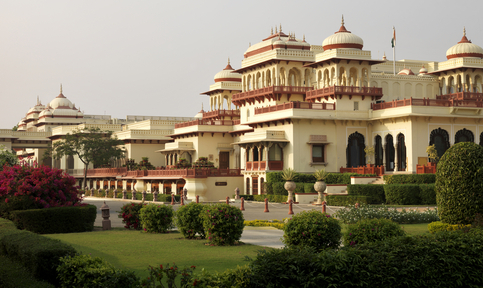 Following a recent renovation, the palace shines even more. 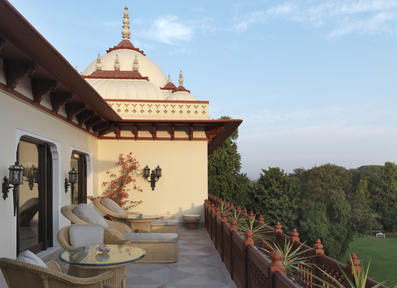 And should the maharani’s suite not be available, a suite overlooking the garden, where peacocks preen and strut in the early morning dew, will revive royal glamour in style. 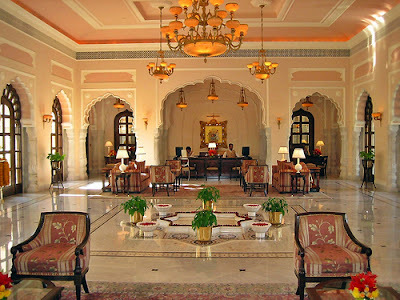 I never want to leave the Rambagh Palace hotel. I can happily spend hours at Mr. Narain Jain’s bookshop there, with its fabulous rare books on India. I sit on the terrace sipping fresh-squeezed pomegranate juice. I rest beneath a neem tree, reading a book, gazing across the gardens. I watch white peacocks perched on a wall. A pony carriage whirls past. But I have to go to the Gem Palace! 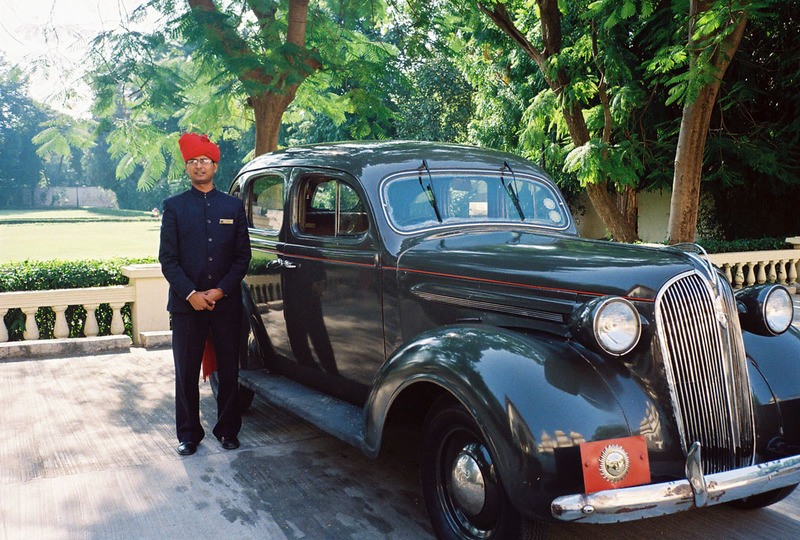 I check with the hotel concierge and arrange to be driven to Gem Palace in one of the current Maharajah of Jaipur’s famous vintage cars. The stately 1937 Daimler, the Maharani’s car of choice, which was my favorite, is not available. It’s in Delhi for repairs. My driver, wearing traditional tunic and turban guides me to the driveway and into the all-wood interior of the rare and superbly maintained vehicle. This time it’s a 1948 Plymouth, army green, all polished up and full of vim and vigor. It has a mere 33,345 on the odometer and the back seat is bouncy with bold new springs. We set off at a stately pace through the cavalcade and chaos of Jaipur’s traffic. This car, air-conditioned, is a traffic-stopper, no doubt. Like all Indian drivers, my designated driver relies heavily on the horn, this one deep and sonorous and at least a little polite. It’s an event to drive through the tree-lined streets, past camel-carts and families (babes in arms) on tiny scooters, leathery old men on wobbly standard bicycles, and helmeted hipsters revving aggressive modern motorcycles, and sari'd girls, all jostling for a place on the dusty roads. This car parts the traffic, glides through the mayhem, keeps a steady course, all with a spotless gleam and clean windows and panache. It’s a lot of fun. Jaipur is the place to find, in bazaars and emporiums, the pure cashmere shawls, block-printed quilts, diamond rings, and fine textiles that turn up—at much higher prices—in trend-setting stores from Madison Avenue to avenue Montaigne and Melrose Place. 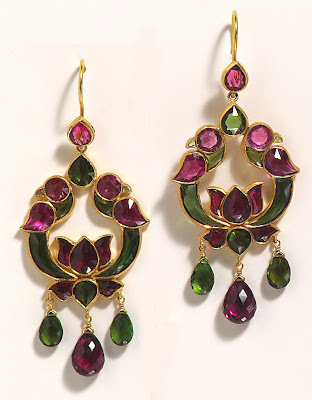 Munnu Kasliwal, a scion of the illustrious family that has run Jaipur’s legendary Gem Palace for eight generations, is considered one of the leading fine jewelry designers and gem authorities in the world. His Munnu/ Gem Palace collections are sought after by jewelry collectors and his newest designs are on dazzling display at Barney’s New York in Manhattan and Los Angeles and other Barney’s outposts. 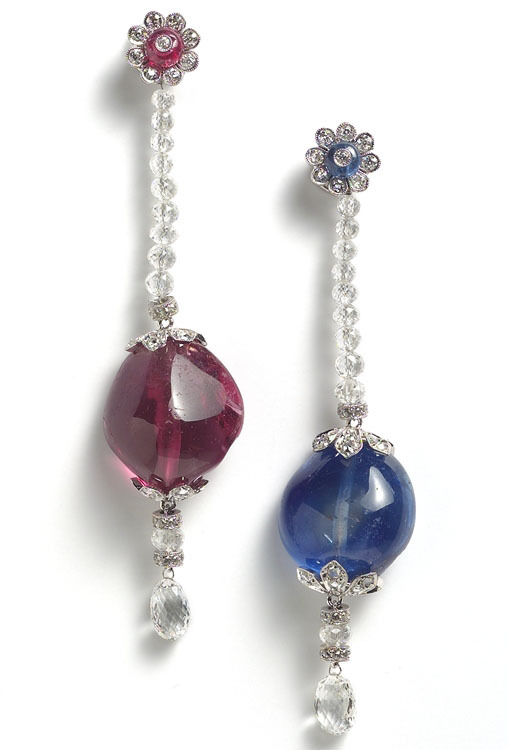 He spills vivid red spinels and pale green emeralds and diamond bracelets and pink sapphires on the table of his private atelier. He takes a maharajah’s turban ornament from a silk pouch and twirls it in his hand. Only in Jaipur are precious jewels displayed with such elaborate grace. Visit his studio by appointment. It’s a salon for friends and fortunate travelers with connections. Among the day’s temptations are kundan-set diamond earrings and a maharajah’s trove of Burmese rubies, sapphire and diamond rings. Munnu’s delights included woven gold belts with diamond buckles, hair ornaments of gold and diamonds, an emerald bead torsade, a bird ring, dazzling emerald earrings, a gold snake bracelet, and a Burmese ruby necklace sparkling with diamond rondelles. 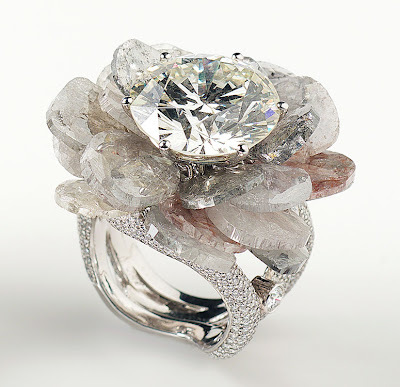 It’s all handmade, and some pieces may take as long as four or more years, even a decade, to assemble the perfect stones, and to elaborately craft and piece together with the highest standards. At Gem Palace I love to see members of the Kasliwal family, all so talented. Sudhir Kasliwal is a highly accomplished photographer, often commissioned to shoot significant heritage images of Rajasthan and Jaipur. He published a cookbook with the Maharani of Jaipur of whom he was a very close friend. Sanjay Kasliwal, so international, runs the shop and greets endless rounds of glitterati (Judi Dench and Maggie Smith were there recently). For old friends of the family, it is now a delight to see the next generation learning from their fathers, eagerly picking up intricacies and business acumen and discretion from their family. Gem Palace is in good hands, with multi-generations of world-class jewelers taking care of business. Top of the top. Taj Rambagh Palace hotel images courtesy Taj Hotels and Resorts, and Rambagh Palace hotel. Car and driver image and some exterior images, by Diane Dorrans Saeks. Munnu/ Gem Palace images: courtesy Munnu Kasliwal, Munnu/Gem Palace, Jaipur and New York. 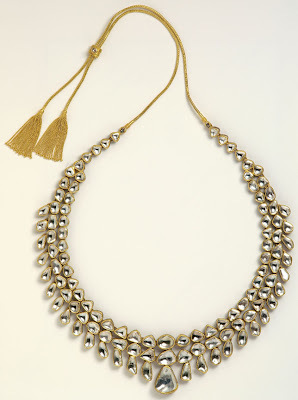 Munnu/Gem Palace jewelry illustrated here is available at Barney’s specialty stores. 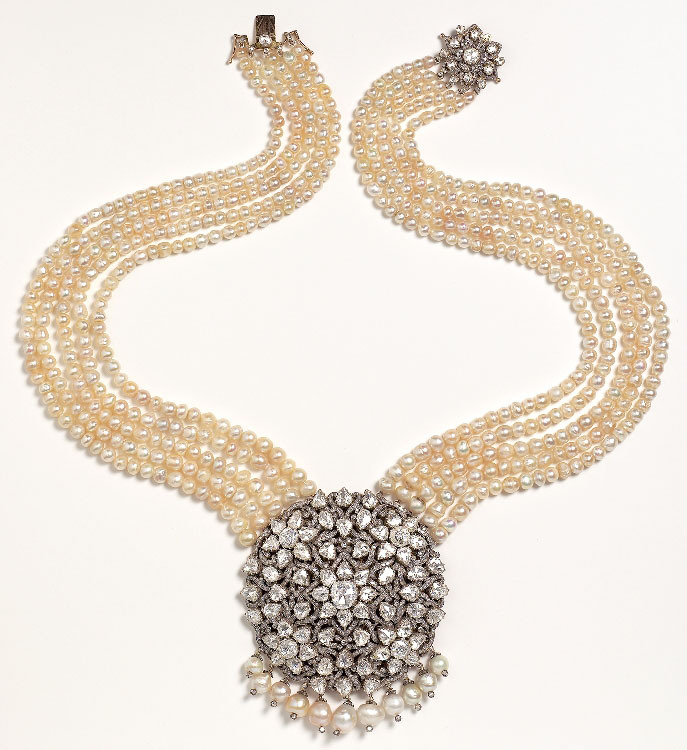 For more information, Munnu Studio: 212-861-0606.
it never really slipped my mind, the finest jewelry lives forever. So true! 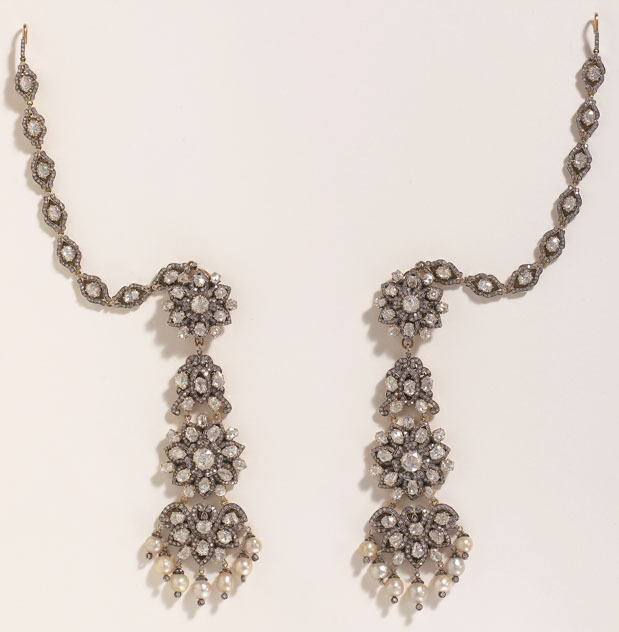 I keep my inherited pieces as personal memories from the past. Again a divine post, you know I always wanted to visit India and when I do the Gem Palace will be on my list...driven in one of the vintage cars. Even fashion seems to do better off here allowing you to go for cool whites or the vivid colours of India. It looks smashing whatever one chooses! Thanks for a great close-up look. 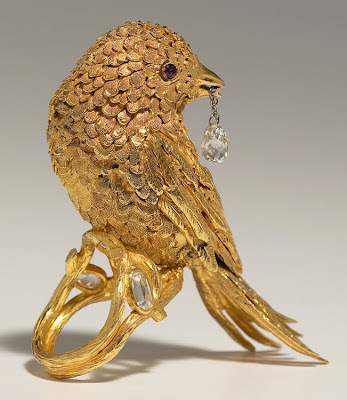 The collection of jewels and the architecture is all divine. 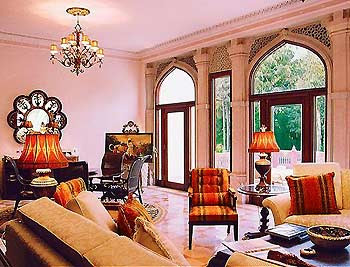 Yes, you would adore Rambagh--so discreet--and you would want to spend many hours at Gem Palace and at Munnu's private atelier. The jewels! Yes...such a great concept--that jewels and gems live on after us, have a soul and many lives. Indians see beyond mere acquisition or 'cost' to something more spiritual. San Francisco: it is 75 deg F here today and so lovely, calm and tranquil. You would love it. Glorious India...what else can we say?! Planning another trip next Xmas. Your stories help encourage making plans come true! Great post on a continent that I personally adore. I have traveled all around India and the Taj properties never disappoint. India is so rich in hitory and culture that you could spend a lifetime studying and experiencing it's wealth, not to mention it's influence on all other world civilizations. I have downloaded this entire post for future reference. Thank you immensely for the detailed information in all of your posts--and the inspiration to resume traveling. Amazing photos, must visit the Rambagh Palace at some point, just stunning. Thank you for sharing. I wholeheartedly agree with your description of Rambagh Palace Diane. I also have the fondest memories of staying there, being greeted by the scent of Jasmin upon entering the lobby, the sumptuous rooms with oversized bathrooms, the attentive yet discrete service, the fabulous bookshop with current editions bound in gilded leather, the men on the roof keeping the pigeons away and the tranquil luxurious pool. You do feel like you are a guest at a very luxurious private palace. As for the Gem Palace, simply stunning jewelry that makes me swoon. I cannot wait to get back to India. I love your enthusiasm and your comments. I adore to hear from my friends that they've traveled to India, that they've been to Jaipur, and that they are intending more travel. I also love to hear that my stories on India are making people want to travel there. So often I hear 'I never wanted to go there until I read your article' or 'It had never been on my 'must go to' list but now it's at the top of the list.' GREAT. 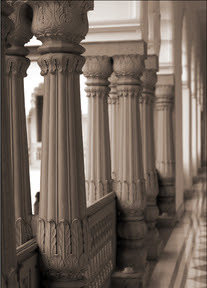 India: culture, history, art, people, vibrant life, and a whole world to explore! It's an essential country to experience. I so agree with you Diane, there is so much to explore that I want to go back over and over again. It is a fascinating country that takes many trips to explore. My brother in law and my niece are there right now, Delhi, Hyderabad, Bangalore and Chennai. I so wish I would be with them. I'll be adding this to my places to visit list!